Various members of this family inhabit our warm tropical reef waters with the best results usually coming during the cooler part of the year, May to September. Large specimens however hang around the deep water reefs and near shore islands all year round and can be targeted using jigging techniques. One locally manufactured chrome lure, called a Bumpabar lure has a distinctive bent shape which flutters irresistibly to these brutes and has accounted for many fine captures. 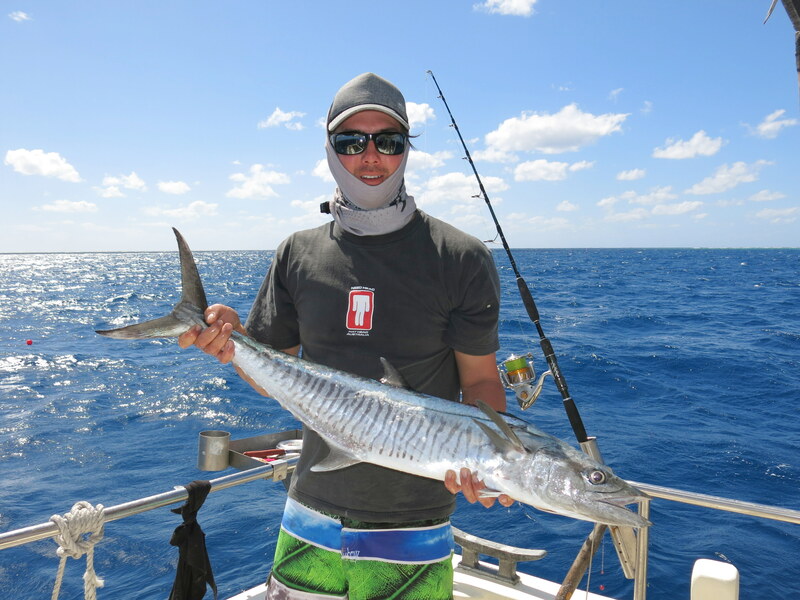 Narrow-Barred Mackerel or Tanguigue (more commonly called Spanish Mackerel or just Spaniards) are the prime target in our waters with specimens to over 60 lb (27 kg) common. They will readily take jigged chrome slices, trolled or floated garfish and pilchard baits as well as trolled lures. Sportfishing tackle of at least 6 kg is preferred with the use of a heavy wire leader and black swivels essential for both lure and bait fishing. Their sharp, scissor like teeth will make short work of anything less and their eyesight is superb. Many a floating bait has been snipped off at the tail, irritatingly just behind any imbedded hooks which must be razor sharp. Once hooked Spaniards will make one long spirited run and usually tire shortly after, smaller shorter runs precede gaffing at the boat. Spaniards are excellent eating but must be killed by a sharp blow to the head and bled immediately upon capture. This will not only preserve the flesh but make them much easier/ safer to handle, most anglers will carry a heavy wooden “donger”, similar to a small baseball bat, on board for this purpose. 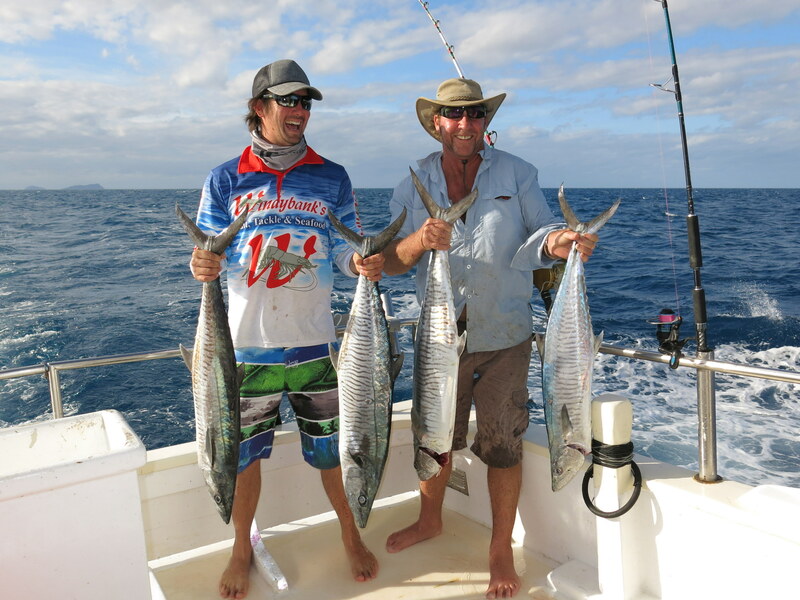 Spotted Mackerel, or “Doggies” as they are known locally, are similarly caught on our barrier reef as well as around the marker pylons at the end of the entrance leads to Cairns harbour. 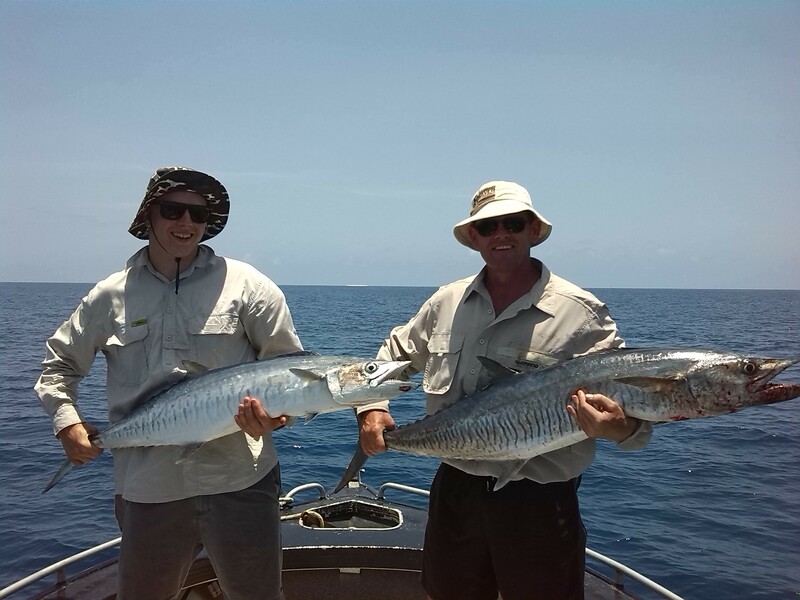 Drifting pilchard of garfish baits is the preferred method for these much smaller fish but captures on lures is also common. The fish can either be cut up into steaks or filleted and skinned, either way the flesh is excellent eating. Size and bag limits do apply.